Recom’s 15 and 20W AC/DC power supplies are designed for low power IoT and household applications. 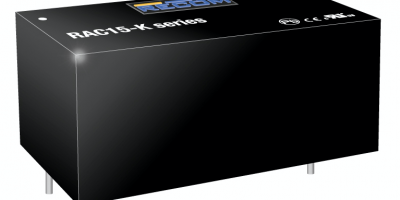 The RAC15-K and RAC20-K are based on the footprint of Recom’s compact RAC10-K modules and feature high-efficiency over a wide load range and minimal standby power consumption. The RAC15-K and RAC20-K series are PCB-mount AC/DC modules with low energy losses especially in light load conditions, says Rutronik. Below 75mW, they have no load power consumption, making them suitable for the always-on and standby mode operations needed for IoT and smart home devices. Based on the latest integrated power design, these efficient power supplies deliver 15 or 20W of power in a modular two x one inch case size. The AC/DC converters have a universal input voltage range of 85 to 264V AC for worldwide use and carry international safety certifications for industrial, audio/video (AV) and information technology equipment as well as household standards. Both the RAC15-K and RAC20-K devices have an operating temperature range of -40 to +80 degree C and offer fully protected 5V DC single outputs. The modules meet EMC class B far below the limits without the need for any external components. The range of single output (five to 48V DC), dual output options (12 and 15V DC), and wired versions will be available later this year. Target applications include smart homes and smart offices, building automation, security and communication systems, door access controls, remote sensors and actuators, climate controls, touchscreen interfaces, and garage door-openers. Recom is a development, design and manufacturer of DC/DC and AC/DC converters, switching regulators and LED drivers. The company provides worldwide customer service, and has more than 30,000 compact modules for use in a wide variety of applications. Rutronik is a global, privately held, broad-line, stocking distributor currently ranked as the third largest European electronic components distributor, and the eleventh largest worldwide. The distributor’s product range includes semiconductors, passive and electromechanical components, as well as embedded boards, storage technologies, displays and wireless products. Primary target markets include automotive, medical, industrial, home appliance, energy, and lighting. Rutronik also delivers consulting services for technical, commercial, and logistical issues, with service and technical support to customers worldwide. Their e-commerce site Rutronik24 provides customers worldwide 24/7 component procurement and personalized customer support.